It seems that a good amount of members are part of the furry fandom but I've found that to find someone who actually owns/ dresses up is quite rare. It would be interesting to see if anyone among us does happen to dress up and maybe could give some of their experiences in how it feels. I've not been that big in the fandom but would consider myself at least somewhat furry as i have a good appreciation for the art. I hope I'm not stepping on toes in some way with this one. Well I don't have a fursuit or anything, and having both an interest and fear of such I doubt it would happen anytime soon. I've never actually plucked up the courage to do more than just wear a mask, except for once where I tried on a head part of a polar bear costume in private. Of course the likelihood of been owning or even getting to wear a proper fursuit is exceedingly rare, the major hurdle being the maintenance required to keep one in good condition. For me, I find that the few times I've ever worn anything close to such gives me mixed feelings. It brings to me a sense of freedom yet also a fear of losing myself. I dont own one and dont plan on ever wearing one. it just seems wierd to me. I think it would be interesting to try if just to see but yeah, i would say the chances are pretty rare with how costly they can be to get/maintain. Even to try one, You'd either have to be very luck or know someone well who'd have one as I'm sure Moody would be very protective of them. I guess I'm just one of those who tries to never knock a new experience. Really helps to gain perspective. I try to be open minded about it though I'll admit its kinda odd to me. There may be something to it though. Who knows? MOD EDIT: Please use the edit button to avoid double posting. I have nothing against it, but Personally I can't se myself owning one. I can kind of see the appeal but I'm, just not that into my fursona. I've gotta admit, I'm impressed by the suits a lot. When I went to a Manchester Comic Con and saw some in real life, I was even more impressed. Either way, from speaking to those guys and hearing how uncomfortably warm it gets, I'm fine without one for now, heh. I wouldn't mind wearing one. However, I would never spend the money on one for myself. It's just too much money for something I would only wear very occasionally. Edit: I know how much they cost, but how dose one attain a specific fursuite? Like, what are the selections where can I see these selections of fursuites? I can understand that, like i said, its a little odd to me. But then, that's why I'm kinda curious about it. There are business entities that make personalized suits. I saw a few in a few furry sites as well. Ad and everything. Takes 1-6 months to finish usually if I remember correctly, depending on the fabric to be used and patterns to be done. I'd imagine it would get awfully hour really fast in them. Especially with all the movement going on not to mention a good amount of people there. Wow, one to six months? Any sites that I could see examples of some of the fursuites made by these businesses? I'd love a fursuit but it's just not financially viable at this point. Maybe when I graduate medical school. I don't have one nor would I ever want one. I have never seen a fursuit that wasn't extremely high up on the creepiness scale. Last edited by Dubiousity on Mon Mar 19, 2012 9:13 am, edited 1 time in total. I have never seen a Fursuit, but I still was one of those that voted that I would want one. Realistically, I doubt I would ever get one since I likely would never use it, and it is to expensive, but I would like to have one just to have one. I might like one, but the only problem with that is that they are expensive as all get out. If I were to get one, it would have to be a good one. Something that looks good and would last a long time. I know a lot of people who have them (Florida seems to have a large concentration of furries with fursuits). I kind of want one, then kind of don't, so I doubt I'll ever have one. It has to be a really good or really cute suit for me to like it. I met someone with a corgi suit last year though, utterly adorable! I'd probably want a werewolf-type one so I could use it for Halloween. Probably not... I don't know... I heard the good ones were pretty expensive, and they look uncomfortable to wear for a long time, but I can't judge, never seen one in person before. I think it'd be cool to try one on though, just to gain a perspective. I still need to try a fursuit on sometime. Who owns several fusuits? Anyways, I'd kind of want one, its not high on my list of stuff to get, but I'd like one. The guy who drove me to MFF has several fursuits. I'd like to get one, though it would need to be a very high quality one for obvious reasons. I can't imagine myself realistically being able to acquire one any time soon, unfortunately. Before I can even think about investing that kind of money in a fursuit, I have several much higher priority things to save up for. I've got school loans from my old college that I need to start paying off in the next few months, a car of my own would be immensely helpful (and will be necessary whenever our '91 Ford Taurus decides to keel over and die), and then at least several thousand dollars in my bank account for getting a down-payment on a house/apartment and money for bills and utilities for a few months will be necessary. I want one, but at the moment I just can't justify putting that kind of money into something I'll only be using a handful of times in the next few years, and only for recreational events that I'll need to save up separate funds for anyway. Maybe 5-10 years down the road. Financial stability is a must. Well it seems that a lot of the time, the cost seems to be the biggest reason you don't see more people in the fandom with suits after seeing some of the posts here. I can understand that what with the general economy and all. Kinda hard for most people to justify the cost when it can be hard to just pay for everyday life. When I can find the extra cash, I may get a partial fursuit, but I wouldn't get a full one. Yeah, a partial fursuite sounds much more reasonable than the full $1500 fursuite. How much do partial suits cost? I wouldn't want a partial fursuit. My fursona is mostly naked and so fluffy it'd be hard to get the clothes to look right. Get tar and feathered furred and you can use a partial suit. My fursona is a bird. How would that work? And either way, I find them unsettling. Kudos to anyone who's willing to spend that much time on a costume though. I admire fursuitter's patience. I saw a really good bird fursuit at MFF. It's not impossible. I would like a fursuit, but they are just way too expensive and hard to care for. And like I said in the Are You a Furry thread, a partial would be what I would probably get. Nope, though my answer for this poll is dependent on my answer to "are you a furry" thread. Well.. It would be nice to have one. But I'll never: wear in any of public place or show it to my friend. they will give me a dirty look. Having one would be cool, but the expensiveness and my laziness will mean I probably won't get one. I guess in the end i wouldn't mind trying one, but i couldn't see myself ever getting one of my own. To high a price and i doubt it would be used often enough to justify getting it in the first place. I hope this isn't too old of a thread to post a response. I'm not quite 'furry' per se - nor will I be attending any furry cons in the near or even far future. I am enjoying the mascotting and costuming aspects in conjunction with local charity fundraisers and art festivals. 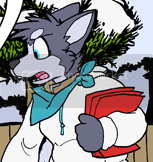 I am a reader of housepets - That, and Mark Stanley's 'freefall' are two of my favorite web comics. So, I don't know if you'd consider this creepy or not (those of you who said that you've never seen a fursuit that wasn't creepy), but my mascot costume is called Tycho. It's a blue merle colored Australian shepherd. I had never seen a fursuit in real life either, until Tycho arrived in the mail this past April. It took me about two years to do the artwork, design, then have fabricated by Beastcub Creations out of Sacramento, California. It just seemed too cool of a concept to not try it out. Local reactions at the supermarket where we did our first fundraiser and by township parks & recreation staff has been phenomenal. I've got my second appearance booked for early June, as the mascot for the arts festival. Usually I'm a guitar playing, firearm shootin', Tae Kwon Do practicing, dirtbike riding, racecar driving kind of guy - A married electrical design engineer with teenage kids and a very busy schedule... However Tycho makes me feel happy & lets me cut loose & be the clown I cannot otherwise be in real life. THAT IS SO ADORABLE I WANT TO HUG YOU! Uh... yeah! That's really great! It's also cool to have someone with a fursuit on the forum finally! Welcome to our friendly community! 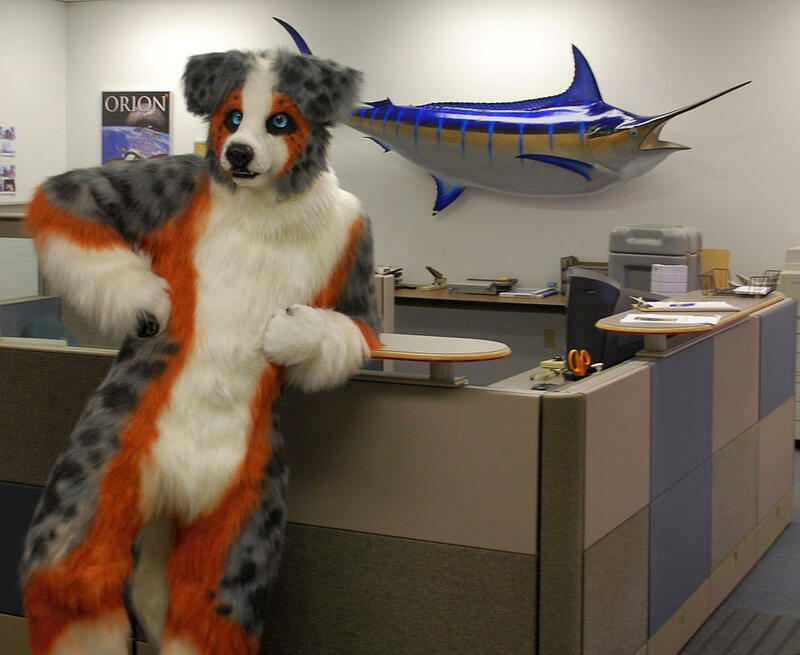 It's also cool to have someone with a fursuit on the forum finally! Is it Ironic that this one doesn't identify as a furry? and I don't find it creepy at all. It's the right mix of cartoony and realistic. 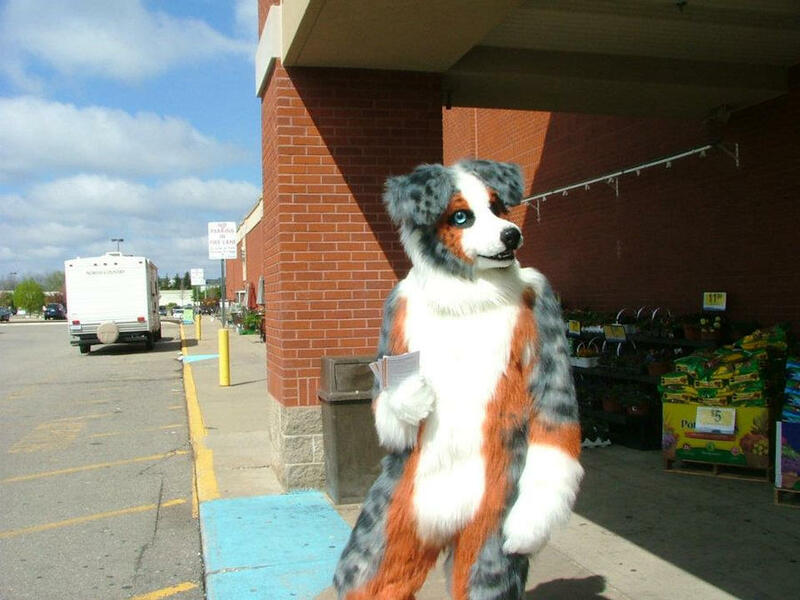 I shouldn't find that so funny, yet I do, its awesome, because why not fursuit at the Home Depot.